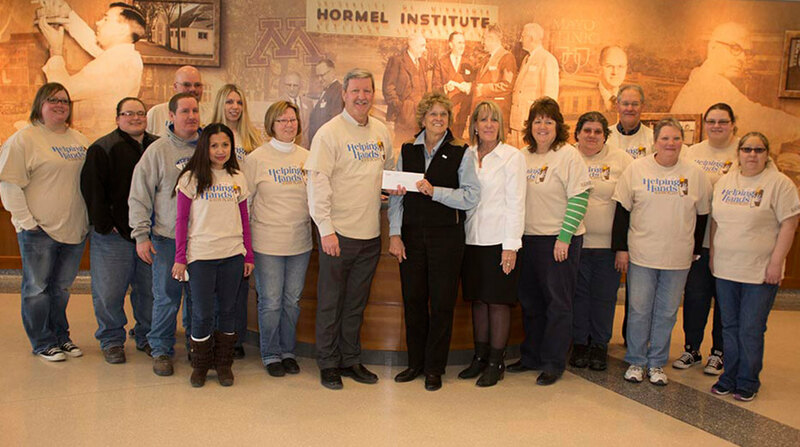 Austin Plant employees of Hormel Foods Corporation (NYSE: HRL) today presented a donation of over $12,000 to The Hormel Institute to support Paint the Town Pink fundraising efforts for cancer research. The plant’s Helping Hands Committee organized activities to raise money, such as bake sales and raffles. This year, Timothy J. Fritz, plant manager of the Austin Plant, challenged his employees to raise over $10,000. In exchange, he dyed his hair and mustache pink. “The Austin Plant employees are passionate about this event, and on behalf of our employees I’m thrilled to present our donation of $12,703.80 to The Hormel Institute to support their Paint the Town Pink fundraising efforts,” Fritz said. Austin Plant employees have donated more than $44,000 since 2012 to support Paint the Town Pink fundraising. “I don’t think there is anyone who hasn’t been touched by cancer, and I think that is why we have such great success with this,” said Becky Rector, Austin Plant Helping Hands Committee member. Hormel Foods Donates Products to Help Feed Flint Families in Crisis Hormel Foods donated a semi-trailer of products to help Flint, Mich., families dealing with the unprecedented water and economic crisis. Hormel Foods Donation Helps Fight Hunger in Alma Alma (Kan.) Foods donated $10,000 to the Community Health Ministry to fight hunger in the Alma community. Hormel Foods Corporation, based in Austin, Minn., is a multinational manufacturer and marketer of consumer-branded food and meat products, many of which are among the best known and trusted in the food industry. Hormel Foods, which leverages its extensive expertise, innovation and high competencies in pork and turkey processing and marketing to bring branded, value-added products to the global marketplace, will celebrate its 125th anniversary in 2016. The company is a member of the Standard & Poor’s (S&P) 500 Index, S&P 500 Dividend Aristocrats, and was named one of “The 100 Best Corporate Citizens” by Corporate Responsibility Magazine for the seventh year in a row. Hormel Foods also received a perfect score on the 2016 Human Rights Campaign Corporate Equality Index, was recognized on the 2015 Best for Vets Employers List by Military Times, and was named one of the 2015 40 Best Companies for Leaders by Chief Executive magazine. The company enjoys a strong reputation among consumers, retail grocers, foodservice and industrial customers for products highly regarded for quality, taste, nutrition, convenience and value. For more information, visit https://www.hormelfoods.com and http://2014csr.hormelfoods.com/.